Adam has been building stuff again. 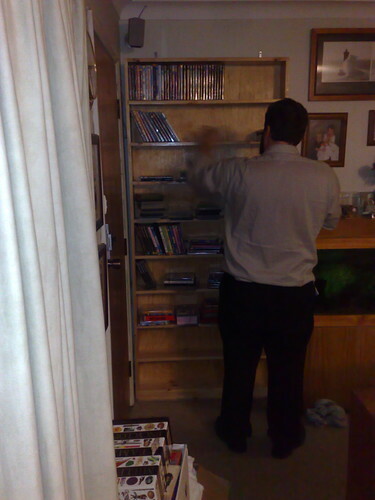 This time it’s DVD shelves and we’ve just moved the first new shelving unit into place in the lounge room. He’s made two of these, to fit one on each side of the fishtank. The bookshelves that were there before, that had been bursting under the load of our ludicrously large DVD collection, will be relocated to the kids rooms where they will hopefully have some tidying influence on their rooms (I’m an optimist). I estimate each unit will hold almost 500 DVDs. Wonder how long it will take for us to run out of room again? Well done Adam! Do you have a guesstimate on how many DVDs you have already? How awesome to have a carpenter in the family! Larry is handy, but a builder he is not. Now just one question… who can afford 500 DVDs? Silly Alix! There are always ways to get things for very little money! Looks good Mim! I like YOUR new picture too!